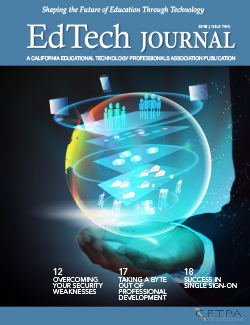 The EdTech Journal is an interactive industry trade publication that is published by CETPA in digital and printed versions for use by our membership and California colleges and universities for use in curriculum. The Association’s trade journal has a circulation of approximately 5,500 and is available on our website. Articles and information contained in each issue apply directly toward current technology issues in the K-20 educational environment. The goal of our journal-based publication is to further establish CETPA as an authority to our California legislature, California Department of Education, and other professional organizations such as ACSA, CCSESA, CASBO, CAAASA and CUE. Subscriptions are free and open to the public. We do ask, however, that you register as a subscriber so we can learn about how to best serve your needs. You may choose to subscribe either to printed or electronic publications. If you are a current CETPA member, please sign in and update your profile to ensure you are subscribed. Nonmembers may use the link below to subscribe.